I used the January Toolshed Kit: Winter Adventure Bonus Fairy Garden papers to make this card. Additionally I used the Tim Holtz Chipboard Sayings from the Toolshed: Winter Adventures Bonus Embellishments, and a heart from the Bonus Chipboard Kit. I am in love with these hearts embellished with Stickles. This card uses the colors "Blue Bayou" and "Mercury Glass". I wish I could show you the sparkle in real life! Use the sample card to assemble the layers. I used dry adhesive for all of the patterned papers and wet adhesive for the chipboard sentiment and the heart. This card really lends itself to any time you need to send a note of encouragement. Thanks for stopping by and I'll see you again next week. Hey everyone Kim here. Today I'm sharing another layout for March. 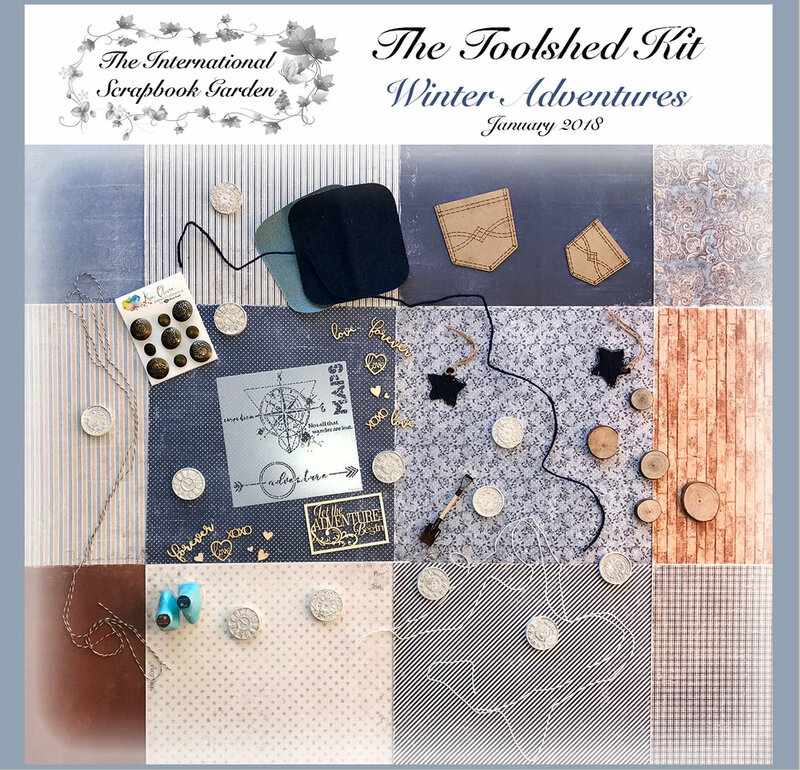 I created it using the Toolshed kit: Winter Adventures from The International Scrapbook Garden. This kit is filled with the Denim and Friends paper line from Maja Designs and lots of other goodies. One of the papers has all these masculine images on them. I cut a couple out and paired them with another sheet of paper. I kept the layout pretty simple, a little mixed media and minimal embellishments. However, I really like how it turned out. I used items from the main kit, the bonus chipboard kit as well as the mixed media kit. I pulled in a couple of things from my stash to add as well. I think the texture is what makes this layout. The music note flower is from my stash. I thing the kraft color keeps it masculine. I used a woodgrain stencil and modeling paste for texture. I added some random stamping with a crackle stamp. I finished it off some splatters with the Lindy's mist from the mixed media kit. The title chippie was initially white, I colored it with the brown chalk ink from the main kit. If you do this, make sure you give it a blast with your heat tool to dry the ink (it will smudge). I added some stenciling, stamping and splatters to the opposite side of my layout to balance it out. Sometimes it doesn't take much to make a masculine layout. That's all I have for today, thanks for stopping by. Happy Friday! Almost time to celebrate St. Patrick's Day! I'm here today using the Winter Tool Shed Kit bonus 6 x 6 papers, with an upbeat card entitled, enjoy the journey. 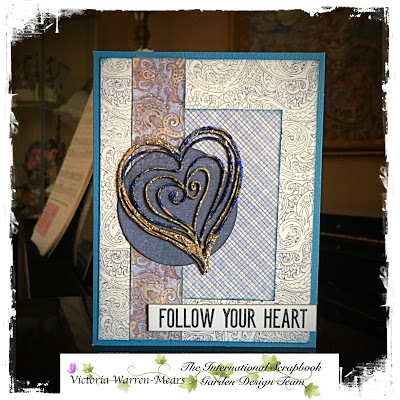 For this card I used only items from the kit, except the bright blue hearts from Queen and Company from my stash. This card features six paper designs used in small amounts. The background seemed best as a solid denim. All these papers are from Maja and come in the kit. I just love all the blues, and notice how the floral prints blend without making the card look overly feminine! Every layer was edged with the Prima Chalk Ink in Farmers Jeans. I did distress the first layer with scissors, but other than that just straight edges chalked. The sentiment is from the bonus embellishments: Tim Holtz chipboard included in the kit. There are so many great sayings I could just play on forever. I hope you are all enjoying the journey today. And I will see you next week with another card from the kit!